A common pesticide used on crops compromises a queen bumblebee's ability to lay eggs, threatening her colony with extinction, according to a study released Monday. Lab experiments used doses of thiamethoxam—one of the controversial neonicotinoid family—that corresponded to what a queen bee might encounter in the wild. Exposure to the chemical shifted the timing of colony formation and reduced the number of eggs by more than quarter, the researchers said. 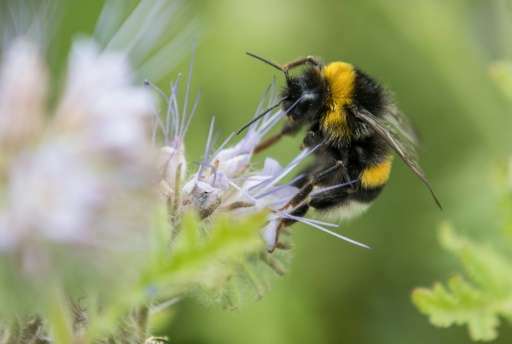 "This showed that the impacts of neonicotinoids on colony founding—by itself—significantly increases the risk of an exposed bumblebee population going extinct," Mark Brown, a professor at the University of London and co-author of the study, told AFP. The chance of colony collapse is at least 28 percent, he said. Neonicotinoid pesticides are widely used in agriculture, but recent studies have suggested a strong link with declining bee populations, especially over the last decade. As a result, in 2013 the European Food Safety Authority (EFSA) imposed a partial, temporary moratorium on their use, pending the result of a review scheduled for completion later this year. But scientists are still trying to pinpoint how the insecticide affects bees, which are crucial for the pollination of crops ranging from almonds and apples to peaches and plums. The new findings, published in the journal Nature Ecology & Evolution, highlight a plausible scenario. "Previous studies have ignored a key aspect of the bumblebee life-cycle, which is the colony founding stage," Brown said. "As successful colony founding is key to the size of bumblebee populations, and bumblebee queens feed on crops and plants that can be contaminated by neonicotinoids, this life-cycle stage could be key in understanding the impacts of neonicotinoids." Bumblebee queens already face a multiple hurdles in starting a new colony. If they manage to survive the winter—during which that can shed 80 percent of their fat reserves—they must still confront parasites, predators, bad weather and a lack of food. Coping with insecticides may be a threat too many, the researchers said. "These pesticides can have a devastating effect on bees, and we urgently need to know more about how pesticides could be affecting other species," said co-author Nigel Raine from the University of Guelph in Canada. A global review last November concluded that some 1.4 billion jobs and three-quarters of all crops depend on pollinators, mainly bees. There are some 20,000 species of bees responsible for fertilising more than 90 percent of the world's 107 major crops. Last year, the United Nations said 40 percent of invertebrate pollinators—particularly bees and butterflies—risk global extinction. So-called "colony collapse disorder" has been blamed on mites, a virus or fungus, pesticides, or a combination of factors. Neonicotinoids—lab-synthesised pesticides based on the chemical structure of nicotine—appeared also to be linked to declines of butterflies, birds and aquatic insects. Widely used to treat flowering crops, they are designed to be absorbed by the growing plant and attack the nervous system of insect pests.